Book a skilled lawn pro in Bedford. Backed by a total satisfaction guarantee and amazing customer support. Bedford is right in the middle of it all. 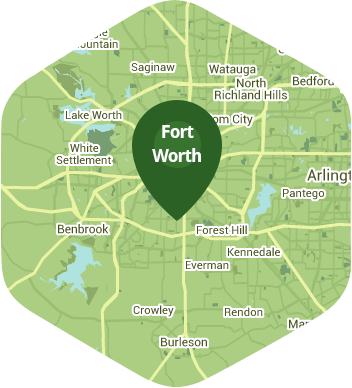 You have access to Fort Worth and Dallas, and all those cities have to offer. When you think of the things you love to spend your free time doing your mind probably flashes to wandering around the Farmer's Market or taking the family down to the aquatic center. The last thing on your mind is working on your lawn, yet there your lawn is with work waiting to be done. How can you enjoy your free time and have a beautiful lawn all at the same time? It's simple - you need Lawn Love. Lawn Love is a fully insured and bonded lawn care service. Our experienced and knowledgeable lawn care technicians know what your lawn needs to stay beautiful. We can take care of all the weeding, seeding, trimming, mowing and clean up - all you have to do is give Lawn Love a call. To take advantage of our free, fast and easy two-minute quote, just call Lawn Love at 817-345-6362 today to see how a little Lawn Love can free up a lot of your time! Rated 4.72 / 5 stars in 4,119 Bedford customer reviews. There won't be any rain in Bedford today, which means you'll probably have to water your lawn. Dusk and dawn are the best times to water your lawn (the sun will rise at 6:48 AM and set at 8:05 PM today in Bedford). Here are some average lawn care prices for homes in Bedford. Average lawn size 3,724 sq. ft.